Description: An empty pipe train passes Messalonskee Lake. 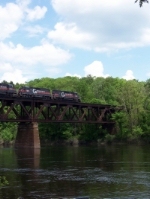 Description: An empty pipe train passes Maranacook Lake. Description: An empty pipe train rolls into Lewiston. Description: Its a dull winter day with NS and Guilford power idling in the cold by the old Boston & Maine tower. Description: Horns blaring, B&M 335 rolls through a crossing on the front of a short, rapidly moving train. Description: A short train led by B&M 335 rolls through the Belgrade area. Description: A short train powered by three locomotives passes through a crossing. Description: An over-powered train crosses Belgrade Road. Description: Three locomotives power a train through the woods near Readfield. Description: Three locomotives lead a train out of the woods toward a rural crossing. Title: Rolling through the countryside. Description: A train from Waterville travels through the countryside toward Winthrop. 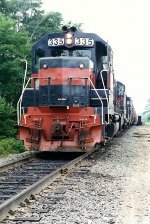 Description: B&M 335 and train roll toward the Plains Road Crossing. Description: SEWA northbound at CPF 228.